10. 12. 2014 - Happy Birthday! Our beloved Eliška is already 9 years old! 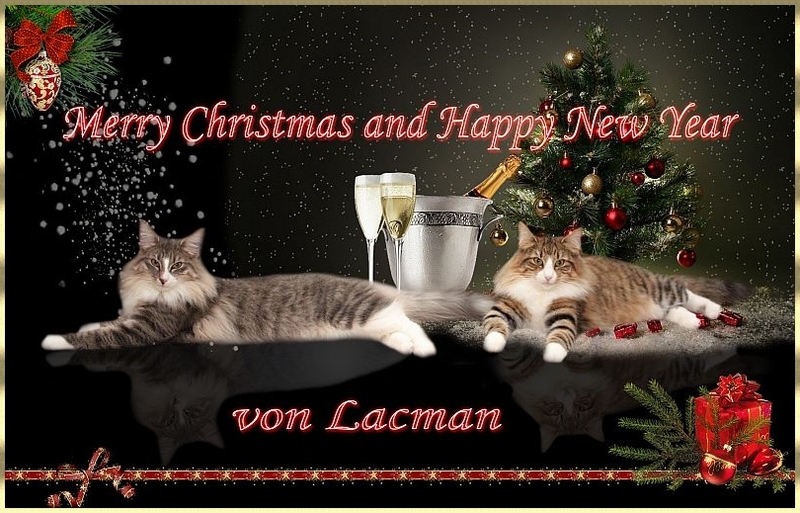 6.12.2014 - We like to proundy annonce, then we have a first DVM von Lacman! Enrico! Big Thanks for showing him! Congratulations! 23. 11. 2014 - Happy Birthday! Litter "A" is already 7 years old! 20. 11. 2014 - Happy Birthday! Litter "H" is already 1 year old! 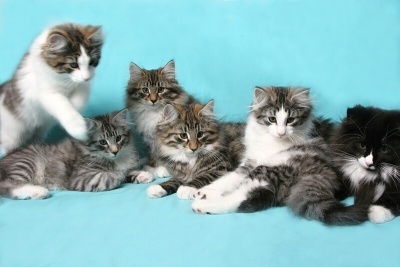 18.11.2014 - We like to introduce our kittens from litter "CH" on their litter page. We will keep you informed about some news and pictures every Wednesday. 1.11.2014 - We would like to introduce our upcoming litter CH. More info in the "Plans"
9.8.2014 - Happy Birthday! Litter "G" is already 1 year old! 8.8.2014 - Happy Birthday! Litter "B" is already 6 years old! 4.8.2014 - Happy Birthday! Litter "F" is already 2 years old! 30.7.2014 - Happy Birthday! Litter "E" is already 2 years old! 1.7.2014 - We like to go to the best way of breeding and the whole-life education is very important for us. 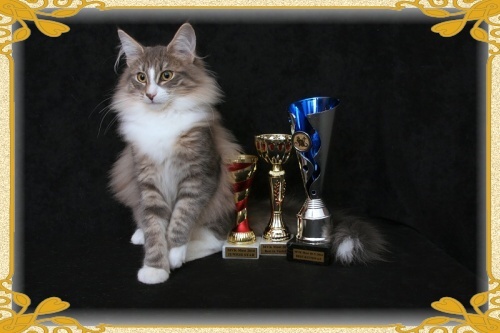 We already done a Pawpeds Academy complete courses G1,2,3 and we are a first cattery from Czech republic, who did this prestige academy complete. The list of students Pawpeds Academy G1 is here, G2 here and G3 here. I hope a lot of breeders will folow us and start to educate this way. Happy Birthday! Litter "C" is already 5 years old! 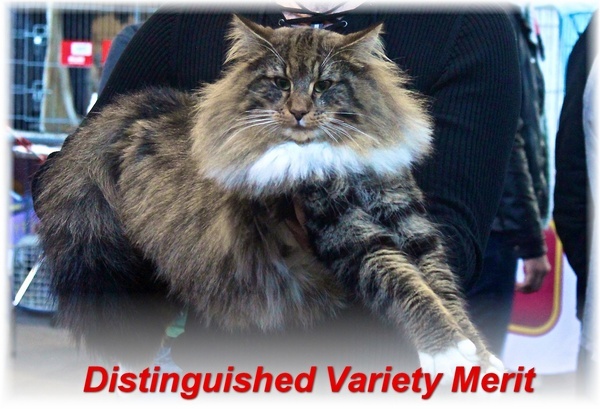 Our cats Elisabeth and Hillary was present us on the Cat show in Vinièné /SK/. We are so pround for our ladies and big congratulation! Int. 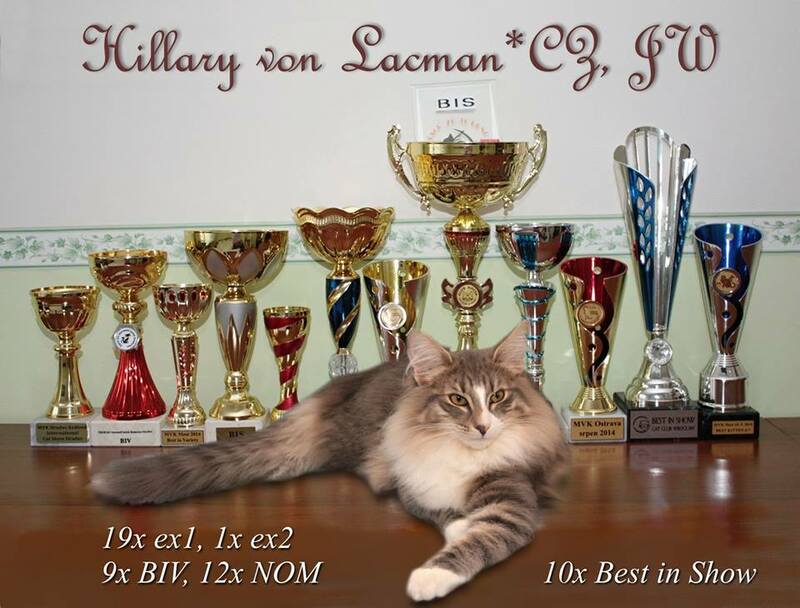 cat show in Most was for our Hillary succesfull again. Saturday: ex1, nom, BIS and Junior Star. Sunday: ex1, BIV, nom and BIS. Congratulations, our small treasure! Happy Birthday dear Bonnie Hope Cat*CZ ! Bonnie is 9. years old today! We wish you all the best and the main is a good health! All kittens are already in the new homes, we wish them all the best and lot of love. We decidet to keep Hillary as a new support in our breeding. 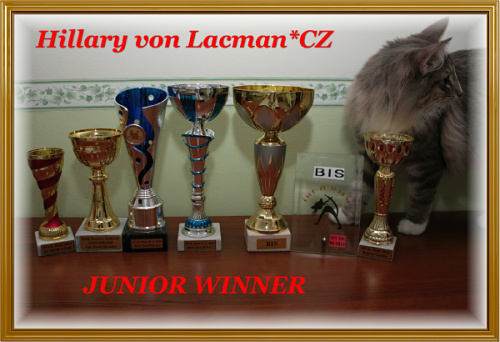 She was really excellent in presentation of us on the cat show in Hradec Kralove with results: ex1, BIV-T, nom and Best in Show kitten! We are so happy! All the news are mainly presented on the Facebook profile with my name. Our lovely Charlotte von Lacman*CZ leaved to the new home. She was not able to accept a change in the group after her neutering and started to eat so much. Her weight increased and we can accept only posibility to find her new home. He is living in the home with our friend Jan in Lovosice. 24.2.2014 - Happy Birthday! S*Zygot´s Yaki-Da is already 7 years old! We wish you all the best! 20.2.2014 - Happy Birthday! Litter "D" is already 3 years old! We wish them all the best!